Mike Minotti Recommended by Dean Takahashi (who was part of the jury last year), Mike Minotti is the community manager and staff writer at GamesBeat, but he also handles plenty of writing duties. Unlike all of those fancy guys covering video games from San Francisco, Mike reports on the industry from the magical land of Ohio. He also co-hosts The Exploding Barrel Podcast and likes Mega Man, Star Trek, and pro wrestling. He started as a community writer for Bitmob, the site that former GamesBeat editor-in-chief Dan “Shoe” Hsu cofounded with former EGM and 1UP.com editor Demian Linn. Minotti became an intern for Bitmob in 2009 and then turned his efforts into freelance work when VentureBeat absorbed Bitmob and turned that community into GamesBeat Unfiltered in 2012. 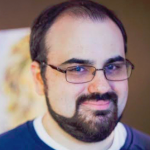 Minotti parlayed his freelance work into a part-time gig with GamesBeat in May 2013, helping with the community and writing(Venturebeat).